Professional sports were different when I was a kid. There was baseball, and there were all the other sports, whose only purpose was to kill the time between October and April, when baseball started again. The truth is, that’s how I still see it, which, of course, makes me a throwback to an earlier era – defiantly so. I had the good fortune to grow up in St. Louis, which gave me access to one of the nation’s richest baseball traditions. The Cardinals have been to the World Series 17 times, and they’ve won it 10 times. Only the New York Yankees have been more successful. I couldn’t play worth a lick; my grade school classmates would all tell you so. My eye-hand coordination was terrible, but it didn’t matter. I could still get wrapped up in the ups and downs of a 162-game season. It was nearly impossible to live in St. Louis and not be a baseball fan. When I was a kid, Stan Musial was the über-Cardinal. He played from 1941 to 1963, taking off a year to serve in the Navy during 1945. He announced during the 1963 season that he planned to retire. I remember watching his last game on TV – Sept. 29, 1963. It was broadcast locally, which was a rarity for a home game in those days. It was done so that all of Musial’s hometown fans could witness the end of a remarkable career. Stan didn’t disappoint; he had two hits that day, just as he had during his first game in 1941. The next year – the greatest baseball season of my life – the Cardinals made it to the World Series for the first time since 1946. The Philadelphia Phillies folded during the last two weeks of the season, and the Cardinals edged them out on the last day to play the Yankees in the World Series. Some friends and I – none of us more than 15 years old (I was 14) – stood in line all night to get standing-room-only tickets to the second game. We smoked our first cigars to try to stay warm, but we learned that didn’t work. St. Louis won the series four games to three, in part on the strength of the bat and legs of Lou Brock, who had come from the Chicago Cubs to fill the hole in the outfield left by Musial. It would have been wonderful to see Musial in the series. He, of course, was nothing but gracious in recognizing and praising Brock’s contributions to the team. 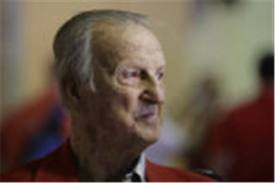 Musial made news recently when President Obama presented him with the Presidential Medal of Freedom, the highest honor that can be bestowed on a civilian. It recognizes those individuals who have made “an especially meritorious contribution to the security or national interests of the United States, world peace, cultural or other significant public or private endeavors.” Sounds like Stan Musial to me. I had the privilege of shaking his hand a few times, most recently in 1995. I was on a flight to Pittsburgh. As I was walking down the jetway to the plane, I looked to my right, and there was Musial, heading back to his hometown of Donora, Pa. The first words out of my mouth? “My favorite statistic in all of baseball,” I said, “is 3,630 hits – 1,815 at home, 1,815 on the road.” Those are his remarkably consistent numbers, and he beamed at the fact that a fan could call them up from memory. “You from St. Louis, are you?” he asked. We talked briefly, and I told him how much his career had meant to me. Tonight, I’m sitting in a hotel north of Los Angeles, and I’ve been watching a preseason game between the Dodgers and the Angels. It’s just a stupid preseason game, but it’s a thing of beauty. So, let the season begin. Slow down, and enjoy the beauty of baseball. And as you do, think about what you can do to bring back all that once was good, and that can be again. This entry was posted in Society and tagged baseball, Field of Dreams, Lou Brock, national pastime, professional sports, St. Louis Cardinals, Stan Musial. Bookmark the permalink.